One of the oldest and best known tricks with seasoned off roaders is known as Airing Down. Simply put, drivers lower air pressure on all four tires to increase the contact patch area and thus increase traction and handling. Airing down is especially helpful in extremely soft or hard terrain such as in sand or when trying to climb over rocks. As an added bonus, airing down also provides a smoother driving experience as the tire conforms over rocks instead of bouncing or slipping off them. When driving on sand, a tire’s natural tendency is to sink and then spin when the throttle is applied. If turning, this issue will be further compounded by the front tires knifing into the sand and (in the case of rear wheel drive vehicles) creating a greater force for the rear tires to push through. Deflating the tire considerably spreads tread over a larger patch of sand and, similar to using snow shoes, allow the tire to gracefully float over the sand. The added effect of driving off road with lower air pressure is that it adds pliability to the tire’s carcass. This in turn allows tires to provide some damping instead of it wanting to skip over road imperfections. Further, because the tire remains in contact with the road surface, handling is not compromised. Of course, these tips only apply to off road driving and are to be practiced under extreme caution. For paved roads you must always follow your vehicle manufacturer guidelines and recommendations. 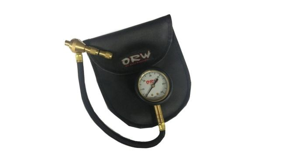 Visit our website or any of our stores for some really great tools for airing up or down as well as more information.